suitable for your class. There also a map of the Museum available. We hope you enjoy your visit to the Museum of Power. The Museum is located at Langford on the B1019 approximately one mile from Maldon and three miles from Hatfield Peveral (Junction 20a/b on the A12 between London and Ipswich). You can leave your coach at the museum for the duration of your visit. The Museum is an ideal environment to learn about the story of water, social history, the environment, science and technology and contains numerous artefacts which help to bring topics in the National Curriculum to life. Discover how power affects us all, from wind or water to nuclear and solar energy. See the machinery that powered the industrial revolution and helped to transform the world. Examine engines that powered aircraft, cars and boats, and learn how electricity is used to provide heat, light and power in our everyday lives. Press buttons to see how things work. From rain to reservoir the story of water is the ultimate story of recycling. A detailed visit plan is available for this topic. The day can include an introductory presentation on water by Museum staff and up to seven water-based activities. A dedicated corner of the exhibition contains models and display boards showing the water cycle and giving a number of fascinating facts about our dependence on and use of this precious resource. Thank you for booking a visit to the Museum of Power (MOP). To ensure your visit goes as smoothly as possible, please read the following directions. From the coach drop off point in the Museum car park, pupils should be led across the bridge and inside the Museum and gathered in the school reception room where bags and coats may be left for the duration of the visit. Pupils remain here while the Group Leader registers your arrival at the Ticket Desk. Payment should be made in full at the Ticket Desk on arrival on the day of your visit. Cash, credit cards and cheques made payable to the Museum of Power are all accepted. Invoice facilities are also available for educational parties. Once the Group Leader has registered arrival and made payment at the Ticket Desk, MoP staff will meet and greet your group/s, give a brief introduction to the Museum, explain the MoP Code of Conduct for school visitors and our guidelines for Health and Safety including Fire and Emergency Evacuation procedures and what pupils should do if they become lost or separated. Coats, bags and packed lunches can all be left in the school reception room but please ensure that no valuables are left unattended. Please take any essential medicines that the pupils may need and your First Aid Box into the Museum with you. We are aware that children need regular access to drinking water through their working day at school. If you feel it is necessary on the day of your visit, school children are permitted to take a small bottle of still water with a screw top into the Museum with them. Please respect this privilege by ensuring only still water is taken into the Museum, as this rule is in place to protect the Museum Collections in general and the handling collections and displays used with school children. The main toilet block is located in the generator hall. There are additional toilet blocks in the grounds, located near the Tea Room. The behaviour of pupils is the responsibility of the teacher. Please see the Health and Safety Page. This document also includes procedures for Fire and Emergency Evacuation and for children becoming lost or separated. The Group Leader should brief all accompanying adults and, where applicable, the children before the visit. We require that schools observe a minimum supervision ratio of 1 to 5 at KS1, 1 to 8 at KS2 and 1 to 15 at KS3 and above. This is also the maximum group walkabout number. Classes should be divided into small groups (as above) with a competent / trained / qualified adult responsible for the supervision and behaviour of each group. The Museum Code of Conduct must be followed at all times. In circumstances where the Code of Conduct is not being effectively enforced, the school will be asked to leave the premises. Adults are to remain with their designated group at all times and under no circumstances are to leave a group solely with Museum personnel. If you are visiting the Museum without any input from Museum staff, please ensure you are fully familiar with the site Risk Assessment and procedures for Fire and Emergency Evacuation and lost or separated children. Ensure that all adults and children are briefed. Lunch is usually taken in the school visit reception area but arrangements can also be made to use the museum Tea Room if this is preferred. The behaviour of pupils in the lunch area is the responsibility of the teacher. Please clear up any litter before leaving the area. If any cleaning materials or extra bin bags are needed, please ask. Please ensure that you have brought along class sets of any extra activities or material that you wish to use on the day. The Museum is not geared up to provide a photocopying service during the visit. As some of the Museum exhibits are outside, pupils should be appropriately dressed and wear suitable footwear. Teachers planning a school visit to the Museum can make a free pre-visit. Although a site Risk Assessment is provided the Museum expects that the health and safety guidelines for school visits provided by Essex County Council have been considered by the group leader. We would also encourage Group Leaders to conduct their own Risk Assessment during their Familiarisation Visit. All parts of the Museum (including toilets) are accessible by wheelchair. A standard cancellation fee of £25 is payable in the event of cancellation within 4 weeks of a booked visit. A map of the Museum and site for teachers and adult helpers is available by clicking here. Please ensure that you photocopy enough maps for your adult helpers. The Langford pumping station, which is now home to the Museum of Power, was officially opened in September 1929. It was designed to provide a daily supply of seven million gallons of drinking water to the Southend district every day. After closing in 1963 the boilers and two of the steam engines were scrapped. The building and remaining engine became a Scheduled Ancient Monument in 1986. 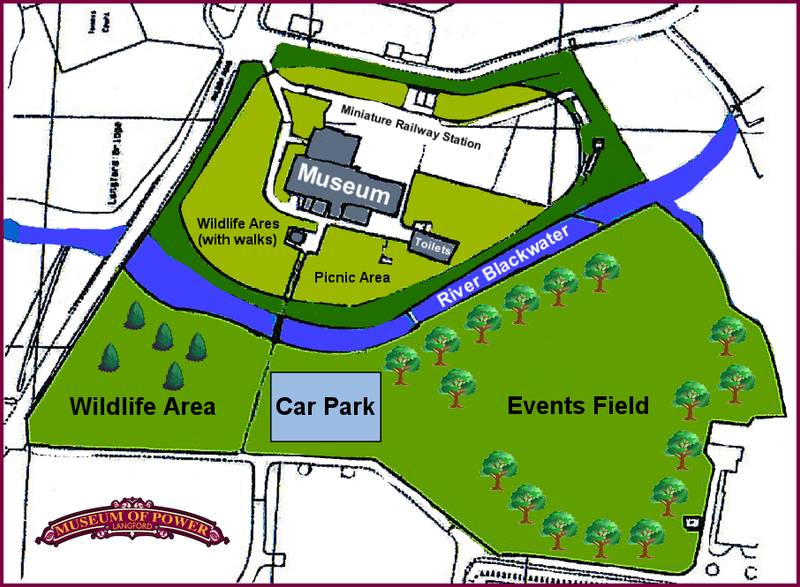 In 1996 the local press announced a ‘Museum plan for pumping station’, revealing plans for the former pumping station to become the home of ‘a unique Power Museum.’ Negotiations between officers of the fledgling Museum, Maldon District Council and Essex & Suffolk Water took place and in December 1996 Museum organizers were given the go-ahead. A more appropriate home for a Museum of Power is hard to imagine. Since the late 1990s the Museum has gone from strength to strength and there are many displays and attractions to inform and entertain both adults and children. Set in seven acres of grounds with the River Blackwater running through, the main exhibits are housed in the 1920s Steam Pumping Station, the former generator hall and boiler house. Pride of place is given to the magnificent Lilleshall triple-expansion steam engine which was returned to steam for the first time in 50 years in April 2011. The Museum includes numerous power, technology and environment related exhibits, with many working examples of power sources, machinery, equipment and tools. Education visits are a key activity for us and we strive to make visiting us as straightforward and as valuable as possible. Please help us to improve by filling out the Visit Evaluation Form provided by your Museum host. "We went to the Museum of Power and learnt about water. It was brilliant! We turned dirty water into clean water. I really liked it. I asked lots of questions. It was better than school. It was excellent".